Quite new with modular, I have this almost complete case. I am wondering if there is any logical way to sort my modules inside the case, or to get ideas how to sort them. Also I would like to have as clean cabling as possible. My mixing board is on the left of this case, where I usually connect with the system, 2 cables coming in and 2 cables coming out, usually via Doepfer mixer A-138s. Also, Doepfer vca and envelope is mainly for E340 oscillator so I guess they should be near? LIVE HOW YOU WANNA LIVE BABY! try it anyway you want, and you can always change. it might depend on how your brain works, how many long and short cables you have and if you work from a set patch or try new things all the time. Pros: minimises cable lengths, 'logical signal flow', similar functions bunched together, easier to trace signal paths. Cons: can get you stuck in a rut of 'usual' patching, harder to try new things as you have a logical signal flow, may prevent interesting experiments, Closer to a non modular architecture. My only $.02 is to keep anything with a touchscreen out of any dense paths of cables. I've learned that no matter how hard you try, it's impossible to be entirely logical about it. 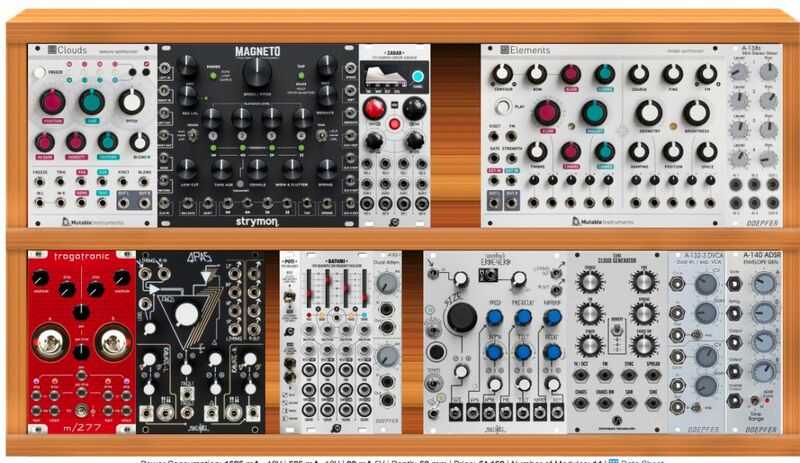 There will always be modules that don't fit into one category, or which physically don't make sense in a particular place in the rack. Ultimately, when your rack is arranged in a way that works for you, it becomes an expression of your creative process. And the creative process is surely not logical, so it's okay for your rack to reflect that. I've gone back and forth on this numerous times, but almost always fall into a mix of maximizing HP and grouping by function (oscillators, modulation, fx, etc). Since I've been trying to focus on live performance as of late, in my main case I try to keep modules that I want to interact with by hand (sequencers, filters, envelopes, mixers, fx) on the outsides of the case and the mostly "set and forget" on the interior rows where they can have cables obscuring them and not be a big deal. Ultimately it comes down to what works for you and I'm not sure if any method is better than another, but one of the beauties of the modular is the ability to route signals paths in unconventional ways, which is partly why I prefer not to group by "voices" necessarily. Generally, I sort my signal path from left to right, oscillator -> mod -> filter -> mod -> mixer -> fx -> mod -> mixer. Modulation is generally closest to me, along with sequencing. I would resist putting them in any "logical" order. Of course it makes sense to put the I/O near the mixer, etc. But, as many points of view have mentioned, take advantage of the modular-ness by arranging modules so it always make you think before you patch. Consider re-arranging things from time to time as well, to reinforce the same idea. That's what I do, anyway. Thanks everyone for your replies, I will investigate further based on my needs and workflow, really interesting your thoughts! Or whatever suits your external gear! Add something....rearrange so it has a logical path or groupings based on my previous effort/findings. Although I will say my logic is non standard as I have no fixed architecture experience! I’m a total rookie. But it works for me. Also I’d like to add colour to the alphabetical numerical scenario. Just to shake it up a bit. I also group my modules, but not consequentially. Generally, my paths are top to bottom. Audio Is more to the left, clocks and mods to the right. I try to keep such modules in the central area that nearly always interact, like envelopes and vcas. But in the end, does that clearly reduce the spaghetti jungle? Not really effectively. In my case, the sequencer is top right, while my vcos are more to the left, so whenever I patch up something with the sequencer, I have long wires across half my rack as starting point. Meh. I just did my first rearrange. I generally tried to keep DSP closest to the "end" - which was the side closest to the external mixer. I put pams ,maths and o_C in the middle since they branch out everywhere for me, but otherwise, I now generally agree with the idea of just put em where they work best for you. At 6U it's not worth worrying about. As you work with it you may discover certain things work better arranged in a certain spot (mostly having to do with ergonomics) but in 6U . . . it's easy to fix. In large setups there are many ways to slice it. I tend to organize by function, but always with an eye toward putting heavy use modules where they won't get covered in cables. Unless you patch the same way each time, there really is no way to put your modules into any optimal arrangement. Hopefully you'll frequently try out new patching schemes, in which case optimal module proximity will change from patch to patch. One of the few things you can do that helps is to place modules with screens in places that allow them to be easily visible through the noodles. All that being said, I do tend to put my modulation sources and utilities toward the center so they can easily reach wherever they might need to go. And, as others have mentioned, it's fun to rearrange often because new patching ideas will occur to you. I try to avoid bunching those together where possible, makes for clearer differentiability in the jungle. As others have pointed out, I don't think there is a "right" way. The key is to make sure you have lots of cables of various lengths. And maybe some Velcro ties. This. A layout may be perfect for one patch, not great for the next, a total pain for the next. Re-arranging per patch? No thanks. Sequencers ( pitch and trigger) , quantisers, buff mults, S/H, some integrated AD/VCA. Oscs. One whole row because i'm an osc freak and have loads. Drums, sampling, CV mods, audio manglers ( a disting, a distortion and a folder) mixing. I run out of VCA or mixer to a mackie console on 1/8 - 1/4 jack converters, which works fine for me. No right way - just what work for each wiggler imo. Hohohoho! So funny! Especially since I have "special organizational criteria" (aka OCD-like tendencies). Whew... Thanks. I needed a good laugh. By release date. Like that you can easily go back and forward in time. Go back in time to an earlier point in your wiggling career by making a patch with only the modules you had (say) three months in. No doubt you'd patch differently now than you would have then. Well, I'm going to try it anyway. I try to categorise them based on proximity and module type, but it isn't a hard and fast rule. I have 3 cases at the moment, so I do what I call the "hydra approach" - each case is fully functional with it's own VCAs, VCOs, utilities, filters etc. and can be used to make full voices.